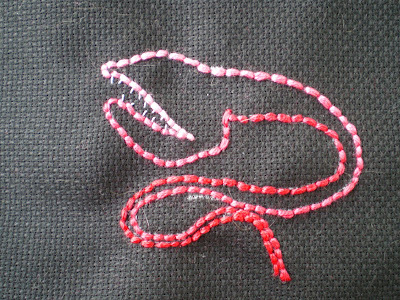 A few weeks ago, I set up a swap with three other people for an embroidered book, and this week I got started on mine. 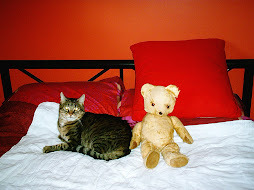 I've been debating whether to blog about it in case my partner sees, but I have now given her a heads-up not to read my blog until after she receives it. I recently treated myself to the David Attenborough series Planet Earth on DVD. What an amazing set this is - well worth watching if you haven't seen it before. It contains the most fabulous film of many different habitats and the creatures that inhabit them. I was absolutely spellbound at the episode where they went deep under the sea and filmed some of the strangest creatures I've ever seen. I thought to myself what great embroidery subjects they would make, and that I could make use of my glow-in-the-dark threads for their bioluminescent parts. They have brilliant names, too - the vampire squid from hell; hatchet fish; umbrella mouth gulper eel. I'm not making them up, honestly! 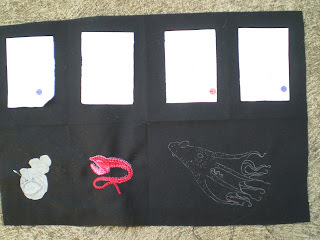 Since my partner in the swap listed ocean things as one of her themes, I decided to embroider some of these deep sea creatures onto black linen. Then I will fold the linen like a mini-zine to make a little book. I'm very much winging it, and keeping my fingers crossed that it will work out, although I've allowed plenty of time until the swap is due to be sent. So here are some pictures thus far. 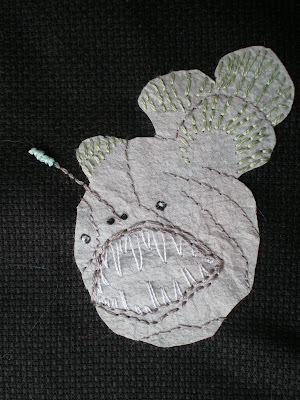 Page 2 shows an anglerfish, one of the angriest looking creatures around, with scary fanged jaws and a bioluminescent photophore (that's that thing sticking out of its head) which it waves around as a lure to attract its prey. I've wrapped the end of the photophore in glow-in-the-dark thread. I'm not quite happy with the teeth and will probably fix them up later. 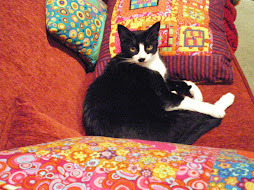 The body is made of Colour Catcher appliqued to the linen. Next up is the umbrella mouth gulper eel whose jaws are twice the size of the rest of its body. I originally did just the outline but the result was kind of underwhelming. 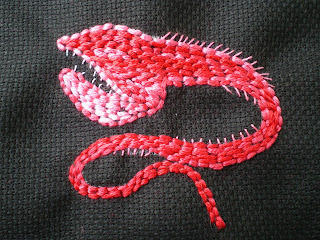 So I filled it in with variegated pink/red thread. This eel has a bioluminescent lure on the end of its tail to attract prey, which I will do when I can get hold of some reddish-pink GITD thread. That's all the embroidery I've done so far. The next one will be my star attraction, the vampire squid from hell, which will be the centrespread of the book. I've drawn him in chalk pencil and will start embroidering later, using pale pink and white GITD, so stay tuned! Planet Earth is awesome. I can't wait to see the Life one they are starting this weekend. Here in the states they have sigourney weaver narrating planet earth. so i often watch it on the BBC to hear the original. It's the same- mostly. I'm not anti-sigourney but there is something about watching a documentary with english narrator. it just feels right. I will have to keep my eyes peeled for Life. Years ago, there was a series called "Life on Earth" which for its time was very good. David Attenborough again. I'm not an Oprah fan either. I wonder why they feel the need to change the narrator for the US market? love the sea creatures. the eel looks so cool!